Corporate teams cook and compete to support FBSJ’s child hunger relief programs. 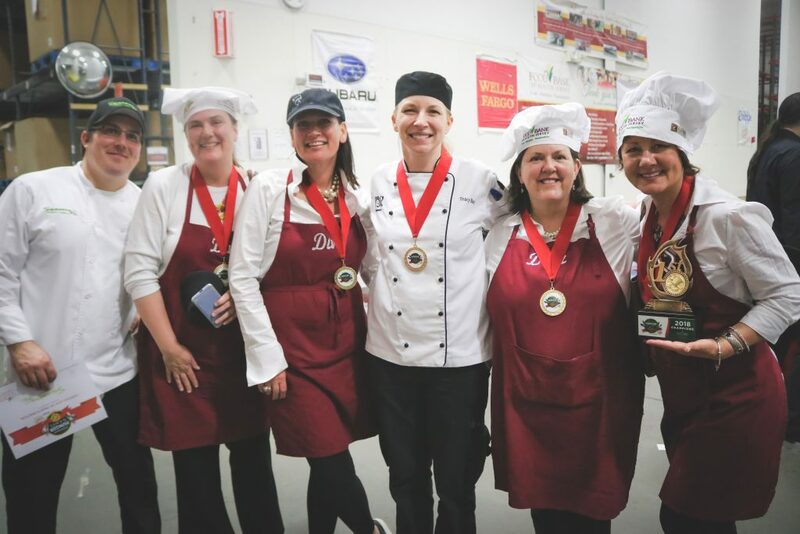 Photo Courtesy of The Food Bank of South Jersey: The 2018 Food Bank Hunger Games winning team, HT Dinner Divas with their mentor chef, Tracy Bray of Wegmans. See what’s cooking at the Food Bank of South Jersey (FBSJ) as they host their annual Food Bank Hunger Games on Wednesday, April 24 from 5:30 to 9 p.m. at their Pennsauken headquarters. The event – an entertaining cooking competition and live show – benefits FBSJ’s children’s programs, which work to ensure that no child goes to bed hungry by providing meals and snacks to needy children on weekends, after school and during the summer months. The creative competition blends elements from the popular Food Network TV show “Chopped” as well as “The Hunger Games” book and film franchise by challenging teams to create a healthy meal in 45 minutes or less utilizing a box of food items that FBSJ typically distributes through its pantry network. Hosted by FOX 29 reporter Bill Anderson, the event will showcase the competitive cooking skills of 15 four-person corporate teams sponsored by South Jersey organizations, including: Federal Rent-A-Fence, HBK CPAs and Consultants, DeVal Lifecycle Support, Jefferson Health, Subaru, Holman Enterprises, CareOne, M&T Bank, Forman Mills, Capehart Scatchard, Wells Fargo and Virtua. Returning this year is event sponsor Canada Dry and Snapple. Cooper University Hospital, In the Kitchen Cooking School, NY & Dad’s Quick Eats, Harvest Seasonal Grill & Wine Bar and Hash House A Go will mentor each team. A dessert tasting and secondary competition, the “Best of the Bite Sized” event, will give a sweet finish to the evening. The contest showcases delicious treats made by local bakeries and restaurants including Dulce Artisanal Pastry, Seasons 52, Chloe’s Crème Puffs, Shake Shack and Mademoiselle Macaron. The Food Bank Hunger Games will also feature the Canada Dry Happy Hour Lounge, complete with music, local food, beer provide by Double Nickel Brewery and local wine from Cedar Rose Vineyards, White Horse Winery, Villari Vineyards and Plagido’s Winery. Those interested in attending the Food Bank Hunger Games can purchase tickets and find more information at www.foodbanksj.org/hungergames. General admission is $10 ($15 at the door).